Answers.com - Answers.com marries the best of community-driven questions and answers with hundreds of respected and trusted editorial reference books. The site knows the best answer to give you, whether it summons the expansive, ever-growing collection of community answers from WikiAnswers, or it taps into its ReferenceAnswers database, a comprehensive set of editorial, licensed reference topics. Bartleby - Bills itself as "the preeminent Internet publisher of literature, reference, and verse - providing students, researchers and the intellectually curious with unlimited access to books and information on the web, free of charge." Featured collections include Bartlett's Familiar Quotations, the King James Bible, Oxford Shakespeare, Gray's Anatomy, Strunk's Elements of Style, and the World Factbook. CIA World Factbook - The World Factbook provides information on the history, people, government, economy, geography, communications, transportation, military, and transnational issues for 267 world entities. Our Reference tab includes: maps of the major world regions, as well as Flags of the World, a Physical Map of the World, a Political Map of the World, a World Oceans map, and a Standard Time Zones of the World map. Dotdash - Has an extensive collection of answers to questions people ask. A great resource! eHow.com: Discover the expert in you.What do you want to do today? No matter what's on your list, eHow can help. With more than 30 categories that cover just about everything, eHow is your one-stop online resource for life's challenges. Professionals in every field come together to offer expert advice, backed by the additional support of a can-do eHow community. Together, they've created a library of accomplishments online–and it's available to you anytime, anywhere. Cook, decorate, fix, plan, garden, budget or update your wardrobe…that's just the beginning of the kind of advice and inspiration you can find at eHow. So join the millions of people who visit us every month. You'll be delighted to find the support you need to navigate through your day. Even better, you'll love the sense of accomplishment you'll feel when the day's done. 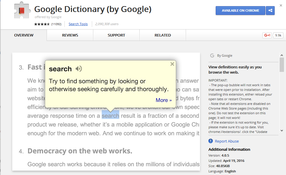 Google Dictionary - Google's dictionary extension on Google Chrome. With it, you can double-click any word to view its definition in a small pop-up bubble, or search the complete definition of any word or phrase using the address bar dictionary. The Dictionary extension supports 11 different languages. Google Translate - Speak with the World. Connect with people, places and culture across language barriers. Now Google Translate has 103 languages. With their translate app, it's like having a personal interpreter in your pocket. Google Translate also has business features. You can use their Website Translator, Translator Toolkit, or their Global Market Finder. ​Internet Public Library 2 - ipl2 is a public service organization and a learning/teaching environment. To date, thousands of students and volunteer library and information science professionals have been involved in answering reference questions for our Ask an ipl2 Librarian service and in designing, building, creating and maintaining the ipl2's collections. It is through the efforts of these students and volunteers that the ipl2 continues to thrive to this day. Merriam-Webster Dictionary - For more than 150 years, in print and now online, Merriam-Webster has been America's leading and most-trusted provider of language information. Each month, our Web sites offer guidance to more than 40 million visitors. In print, our publications include Merriam-Webster's Collegiate Dictionary (among the best-selling books in American history) and newly published dictionaries for English-language learners. All Merriam-Webster products and services are backed by the largest team of professional dictionary editors and writers in America, and one of the largest in the world. Merriam-Webster Visual Dictionary Online - This dictionary not only gives you a definition, but teaches through images. Search a term, and find a diagram. Instead of telling them, why not show them? Reference.com - Words are full of meaning and power. This website enables you to see how words originated and how they have changed overtime. It offers a large amount of games as well, to learn words meanings and to generate quick diction. It also offers a thesaurus, translator, and dictionary. Wikipedia - is a multilingual, web-based, free-content encyclopedia project operated by the Wikimedia Foundation and based on an openly editable model. The name "Wikipedia" is a portmanteau of the words wiki (a technology for creating collaborative websites, from the Hawaiian word wiki, meaning "quick") and encyclopedia. Wikipedia's articles provide links to guide the user to related pages with additional information. Wikipedia is written collaboratively by largely anonymous Internet volunteers who write without pay. Anyone with Internet access can write and make changes to Wikipedia articles, except in limited cases where editing is restricted to prevent disruption or vandalism. Users can contribute anonymously, under a pseudonym, or, if they choose to, with their real identity. 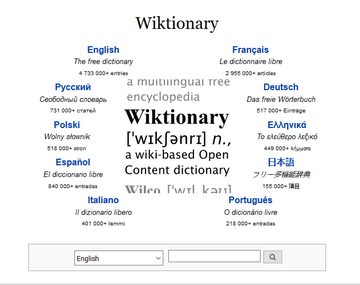 Wiktionary - Wiktionary is a multilingual, web-based project to create a free content dictionary, available in 158 languages. Unlike standard dictionaries, it is written collaboratively by volunteers, dubbed "Wiktionarians", using wiki software, allowing articles to be changed by almost anyone with access to the website.